Hi! Ilove scratch and i'm so glad to be part of it! 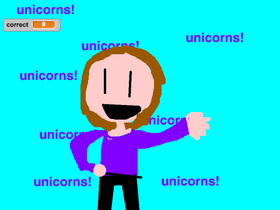 I alsoLOVE unicorns! YES EVERY ONE I HAVE FINALLY CHANGED MY PROFILE PIC!!!!!!!! Guys! i've figured out how to make emojis! Thanks to Dhilly for icon creator for my profile pic! The life of cats is great!